The mountainous southeast of the Tibetan Highland contains China's greatest forest resources, highly diverse coniferous forests dominated by a wide variety of spruces, firs, pines and junipers. Although a lot of valuable forestry research has been carried out, the mostly state controlled forest economy is extracting timber at losses far beyond a sustainable yield. Forests are being reduced at an alarming rate, figures point to over 50% forest reduction in West-Sichuan in only 40 years. Throughout the millennia substantial deforestation has already been caused by man and his grazing animals. The rugged southeastern Tibetan Plateau is deeply disected by the gorges of Tsangpo, Salween, Mekong, Yangtze, Yarlong and their tributaries. Valley floors are generally between 2000 to 4000 m asl. Towering above are mountain peaks usually over 5000 m, the highest being Namche Barwa (Namjagbarwa 7651m), Kawakarpo (Meili Shan 6809m) and Minyak Gongkar (Gongga Shan 7590 m). The steep valley slopes are mostly clad by magnificent coniferous forest. Eastern Tibet contains China's greatest forest resources. The indigenous Tibetan population refers to the region as Kham. Presently it is divided into several administrative units: Nyingchi (Linzhi) and Qamdo Prefectures of SE-Xizang (Tibet Autonomous Region), NW-Yunnan's Deqen Tibetan Autonomous Prefecture (TAP) and W-Sichuan's Aba (Ngawa) and Ganzi (Kandze) TAPs, the latter two being the focus of this paper. The most striking feature of the region is the high diversity of geoecological factors. Extremely rugged terrain and great differences in altitude support a wide range of ecosystems. While the outer fringe is under a maritime climate, the interior plateau is under a more continental regime. Precipitation, just as biomass and biodiversity, declines from the southeast to the northwest. More than 80% of the annual precipitation falls between May and September, transported into the region by the summer monsoon. The core of Eastern Tibet receives an annual precipitation of 600 to 800 mm. The slopes of the fringe receive above 1200 mm. Valley floors are often dryer due to local wind systems receiving 400 to 700 mm/A. The Westerlies dominate during cold and dry winters, monthly precipitation rarely exceeding 15mm. Only north-facing slopes have a lasting snow cover, snow on south slopes melts within a few days due to intense insolation. There is a considerable rise of the altitudinal belts from the fringe to the plateau due to the rise of the surface itself. Thus on the outer fringe treeline is at 3600 m, while in the interior of the plateau (i.e.. around Dzogchen) forests climb up to 4700 m asl., constituting the highest coniferous treeline in the world. The southeastern highland is unequaled in the Holoarctic in biodiversity. Wilson, one of the many plant-hunters who scoured the region for horticultural plants, wrote "the wealth of flowers [..] is astonishing and surpasses the dreams of the most sanguine" (1913:1). Rhododendron alone has several hundred species. Each genus of Primula, Gentiana, Clematis, Pedicularis, Corydalis, Sedum, Saxifraga and Senecio has more than 100 species; in addition Wang (1961:32) listed 52 different conifer species for the southeastern highland. In Jiuzhaigou alone the author recorded 16 species, others 24 (Winkler 1994). 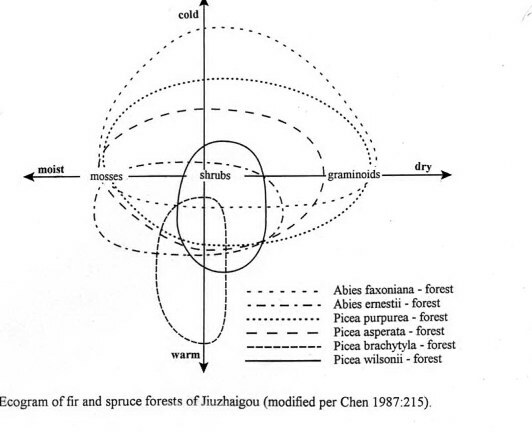 Yang (1985) reports 80 forest formations and 250 forest types in W-Sichuan's mountain forests. 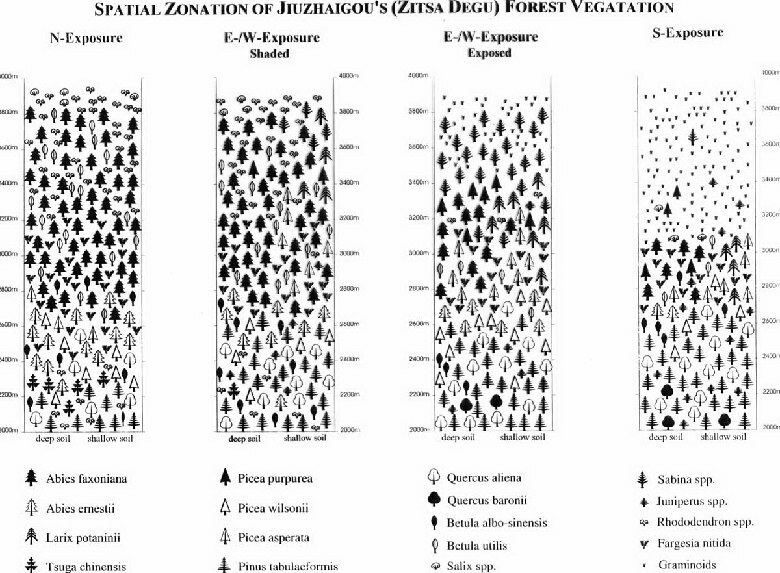 The main forest types of Jiuzhaigou (see Winkler 1994, 1997/98b) and of Sichuan's Tibetan prefectures (based on Li 1993) will be described briefly (see fig. 1, 2 & 3). Map of the Southeastern Tibetan Plateau and adjacent regions. In the hatched area subalpine forests are distributed primarily on the north-facing slopes; south-facing slopes are mostly forest-free grazing grounds. To the northwest of the hatched area forests are presently almost absent. Presently pine-oak forests (photo 1) dominate the lower slopes of Jiuzhai valley between 2000-2400 m, and on south-facing slopes up to 2600 m. The area of distribution is influenced by dry local winds and receives about 700 mm/a precipitation. Valley floors have been cleared for cultivation of maize, barley, wheat and broad bean. Barely a trace remains in Jiuzhaigou of the original Hemlock- (Tsuga chinensis ) mixed forest, which consists of a variety of conifers (Abies ernestii, Picea wilsonii, Pinus armandii) and deciduous trees. The present pine-oak forests (Pinus tabulaeformis, Quercus aliena) are of secondary nature as a result of human impact and fire. Many of the deciduous oaks (Quercus aliena) around the villages are managed in coppice systems or their branches are being lopped. Locals extract timber by selective cutting. Pine forests are prone to fires of low intensity. Evidence of recurring fires is abundant in this altitude and on south facing slopes in general (see Winkler 1998b). In Jiuzhaigou evergreen oaks (Q.baronnii) are only found in the warmest sites, yet in the wider region sclerophyllous oaks are widely distributed on south-facing slopes. Pine forests (i.e.. P. densata, P. armandii) reaching up to 3800 m are common all over Eastern Tibet, although they never reach as high as the upper treeline. Growing stock varies between 100-400 m3/hA. Pines are most competitive in dry, sun-exposed sites with a mean annual temperature of 4-10°C. Hemlocks (i.e.. Tsuga chinensis, T.dumosa) are important constituents of coniferous-mixed forest along the fringe. They climb up to 3200 m in moist warm sites with an maritime climate. In Jiuzhaigou subalpine spruce-fir forests dominate the cloud forest belt (precipitation 1000 mm/a) from 2700 m to 3500 m (photo 2). Abies faxoniana thrives in moist and mesic sites. In mesic sites spruces (Picea wilsonii, P. asperata, P. purpurea) can compete successfully. In dry sites fir and spruces often give way to serial larch (Larix potaninii) and junipers. In the lower range conifers grow up to 50 m (dbh: 80 cm); with increasing altitude growth is significantly reduced (A. faxoniana in 3500 m: 25m, 40 cm).The canopy closure of the multi-layered forest is dense. In the secondary canopy there is often an admixture of birches (Betula albo-sinensis, B. utilis), which establish themselves quickly in gaps. A tertiary canopy consists of small deciduous trees (Acer, Tilia ). From 2700 m to 3200 m the shrub layer is dominated by highly competitive bamboo (here: Fargesia nitida), above it by Rhododendron. Between 3200 m and treeline (3800 m) pure stands of Abies faxoniana (canopy closure 60%) with Betula utilis in the subcanopy clad all northern exposed slopes. Spruce-fir forests are the dominant forests in mesic and moist sites of the subalpine forest belt (3000-4600 m) of Eastern Tibet. They are the most important forestry resource containing over 60% of the standing timber volume. They usually receive more than 700 mm/a precipitation with an average temperature between 2-8°C. Standing timber volume varies from 350-1200 m3/hA. Fir forests (i.e.. A. faxoniana, A. squamata, A. georgii) are usually less productive and more seriously affected by diseases than spruce forests (i.e.. P. likiangensis, P. balfouriana). Forest fires occur rarely in the subalpine belt, but when they occur they have a devastating impact. Larch stands usually indicate recent areas of heavy disturbance such as landslides or fire. Being a heliophilous pioneer species larch occurs on exposed sites often associated with juniper and spruce. In addition Larix potaninii forms forests in the upper treeline on south-facing slopes. Only a few stands of junipers (canopy closure <50%, height: 12m, dbh: 40 cm) with a dense graminoid groundcover remain on south-facing slopes above the cloud forest belt (3500 m) up to treeline (3800 m). Most potentially juniper forested slopes are now pastures (see below) in Jiuzhaigou. Juniper stands (i.e.. Sabina tibetica, S. saltuaria, S. komarovii, S. convallium) dominate south-facing slopes between 3400-4400 m (mean annual temperature close to 0°C). The slow growing junipers are well adapted to cold and extreme diurnal range of temperature and high insolation. They form the transition zone between spruce-fir forests and scrub vegetation and grasslands. In continental areas with only 400-600 mm/a precipitation they grow in all exposures. In Central Tibet there are a few sacred stands of impressive juniper trees left on north-facing slopes around monasteries (i.e.. Reting, Nagarze). They document former forest growth in this otherwise fully deforested areA. Much of the former juniper and some of the spruce-fir forests have disappeared completely and their sites are now yak pastures. Deforestation in Eastern Tibet is documented by pollen-analysis as far back as 5100 years ago, intensifying 2000 years ago; in many locations forest soils are found under present steppe-soils (Frenzel 1995). Very striking is the common phenomenon of forest free south-facing slopes in otherwise forested areas (see map, photos 2,3,5). Previously the absence of forests on the south-facing slopes, which are never snow covered for more than a few days, had been attributed by nearly all explorers to climatic conditions. However research in Jiuzhaigou (Winkler 1994, 1997, 1998) has shown that grazing and burning are the primary causes for continued absence of forests on south-facing slopes. Deforestation in the past shows a clear pattern in developing Eastern Tibet as a grazing land. Though summer pastures above treeline used to be abundant, winter grazing grounds were limited due to the prevalence of forests in lower altitudes. Creating winter pastures through burning or using burned south-facing slopes enabled a larger herd to survive. In addition intruding yaks disturb and may prevent forest regeneration. All of this resulted in extensively replacing forest areas by grasslands, a process which has been dramatically accelerated since the 1950s by extensive logging. A first notion of a forest economy in Eastern Tibet came from Rockhill (1891), who observed Chinese woodcutters and their camps as well as timber river rafted by the Tibetans and Chinese. Along the upper Min Jiang (Aba TAP) commercial logging was in full swing at the beginning of this century (Campbell & Qin 1983) and by the 1930s "hundreds of thousands of logs" were already rafted down river annually. Timber extraction as described in detail by Ku & Cheo (1941:95) was undertaken by contractors, organized from Chengdu. In the Tibetan area of SW-Gansu "a few hundred dollars [could] purchase a large tract of forest" from "local chiefs" (p.93). They also reported in astonishment that around Labrang Monastery a patch of spruce "has been planted by the LamA. It is a noteworthy fact since spruce has never [before then] been adopted in treeplanting in China" (p.88). From the 1950s onward the "logging industry" was developed systematically in the Tibetan areas, making it the "second timber production base in China" (Li 1993:94). Ever since then timber sales are the most important source of cash revenue for local administrations. In Aba TAP the forest industry output value accounted for 70.1% of the total industrial output in 1980; in Ganzi TAP it accounted for 54.7% in 1989 (Zhao 1992:56). The forest industry plays the key role in promoting the development of transport and other industries. Yet Dong (1986:55), former vice-state-secretary of forestry, states that the "administration of forest industry has not conformed to natural and economic principles" and "as a whole, there has not been any attempt to manage the forests". Zhao, a member of the Communist Party Policy Research Department, points out that the state forest enterprises, who control most of the forests, have to meet a minimum state timber quota, which is much higher than the forests' natural annual production. Zheng (1986:34) indicates that the harvest is 2.3 times higher, Smil (1984:227) up to 3 times higher than productivity. To make matters worse the state enterprises have to sell the quota timber well below market prices and even production cost. Most of them try to compensate for serious losses by selling even more timber on the free market. Not surprisingly Yang (1985:41) states that in Aba the actual "annual consumption of forest resources [is] over four times more than the annual increment"! In the early 1950s the standing resources of Aba were estimated at 340 Mm3. Between 1950 and 1985 some 155 Mm3 were used to produce 47 Mm3 of timber. At present 180 Mm3 remains, of which only 34 Mm3 can be used. Out of 11 state forest enterprises 8 exhausted their resources; 5 have no continuous forest areas left. Yet they still have to fund the pensions of their former employees, who outnumber their active employees. They are thus forced to fell protection and shelter forests. Recently the center of timber extraction switched from Aba, which in 1960 alone had to provide 84% of Sichuan's state timber production, to Ganzi where forest exploitation started later. Zhao (1992:58) concludes: "for government's sake, they must hand in the quota timber [..] to the state, there is no way to live on unless keeping over-felling". In addition with the booming economy and increasing market deregulations private entrepreneurs have begun loading their trucks with illegally felled logs, which are bought along the roads from locals. Deforestation has reached alarming dimensions, being most severe along highways and raftable rivers. W-Sichuan's forest cover decreased from 30% in the 1950s to 14% in the 1980s (Li 1993:95). Aba's forest cover was reduced in these 30 years from 19.4% to 10%, removing 60% of the growing stock (Yang 1985:41). Reforestation after felling, which is mostly done by large scale clearcutting (photo 5), is the exception, although required by law. Li (1993:103) estimates the afforested area in the wider region equals only 12.7% of the deforested areA. How many of the planted seedlings will actually grow into trees is uncertain, but a survival rate below 30% is common. A wealth of knowledge accumulated over 40 years of forestry research in West-Sichuan (i.e.. Li 1990, Yang & Zhang 1992, Sichuan Senlin 1992) needs wide scale implementation. Over-exploitation has to be stopped as soon as possible. Timber prices need to be adjusted to the free market and need to reflect actual costs of production. The state quota system needs to be phased out and replaced by sustainable harvest limits as demanded by Zhao. Short-sighted economical interests of local and central administrations have to give way to the rationale of long term multiple accounts. Local communities and administrations need to be included in the management of "their" forests. It takes the realization on all levels of decision-making that sustainable forest management is a far better path of development than mining the forest resource. Zhao suggests also a 'Yangtze upper reaches protection fee' which could be collected from the relatively rich downstream counties and provinces, many of them having benefited previously from cheap Tibetan timber. These fees are to provide funds for reforestation to alleviate the damages of the past and to reestablish and secure a more even water run-off for the future. Moderate flow regimes, which reduce sediment transport, save considerably engineering costs. Hopefully, in connection with China's ambitious plans of utilizing the enormous hydropower potential for industrial development economists and politicians will start to pay more attention to sustainable management of catchment areas. In particular, the gigantic Three Gorges Hydroelectric Project on the Yangtze River could help to arouse wider attention in China to the state of Eastern Tibetan forests. It is left to hope that Zhao's (1992:57) prognosis "If this trend continues in less than 20 years the forests will be exhausted" will not become true and that sustainable forestry as advocated in China's Agenda 21 will replace present practices. Campbell, J.J.N., Qin, Zisheng (1983). Interaction of Pandas, Bamboos and People. Jour. Amer. Bamboo Soc. 4, 1-35. Chen, Cungen (1987). Standörtliche, vegetationskundliche und waldbauliche Analyse chinesischer Gebirgsnadelwälder. Diss. Univ. Bodenkultur Wien 30, 316p..
Dong, Zhiyong (1986). Present situation of forest administration in SW China and its role in river basin management. In: Li & Panday, 53-57. Frenzel, B. et al. (1995). On the Upper Quaternary paleoecology of Eastern Tibet. Science in China (Ser.B) 38.4, 485-494. Ku, C.C. ; Cheo, Y.C. (1941). A Preliminary Survey of the Forests in W-ChinA. Sinensia 12, 81-133. Li, Wenhua (1993). Forests of the Himalayan-Hengduan Mountains of China and Strategies for their Sustainable Development, ICIMOD, Kathmandu, 175p..
Li, Wenhua; Panday, K.K. (1986) eds.. Watershed Management - Proc. Intern. Workshop Watershed Management in the Hindukush-Himalaya Region, ICIMOD/CAS, 162p..
Richardson, S.D. (1988). The Forest Economy of Tibet. Commonwealth Forestry Review 67.3, 253-262. Rockhill, W.W. (1891). The Land of the Lamas, London, 383p..
Sichuan Senlin (1992). Editorial Board of "Forests in Sichuan", China Forestry Publishing House, 1535p..
Smil, V. (1984). The Bad Earth - Environmental Degradation in China, London, 245p..
Wang, Chiwu (1961). 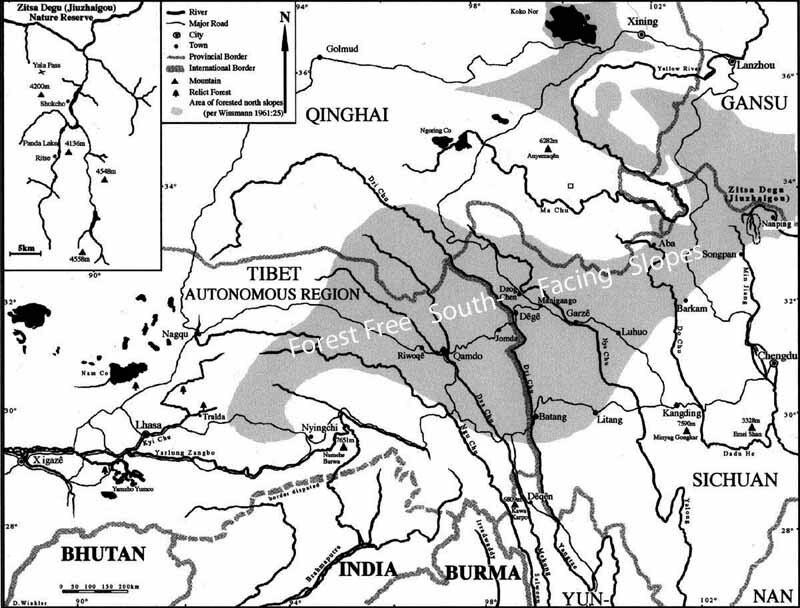 The forests of China with a survey of grassland and desert vegetation, Maria Moors Cabot Foundation publ.5, Cambridge, 313p..
Wilson, E.H. (1913): A Naturalist in Western China, London, 480p..
Winkler, D. (1994). Die Waldvegetation in der Ostabdachung des Tibetischen Hochlands - 3D Vegetationszonierung mit Bodenuntersuchungen am Beispiel Jiuzhaigous. Berliner Geogr. Abh. - Beiheft 2, Berlin, 128p..
Winkler, D. (1997). Die Waldvegetation in der Ostabdachung des Tibetischen Hochlands dargestellt am Bsp. Jiuzhaigous und die historische und gegenwärtige Entwaldung. Erdkunde 51.2, 143-163. Winkler, D. (1998a). Deforestation in Eastern Tibet: Human Impact Past and Present. Development, Society and Environment in Tibet, G.E.Clarke ed., Proc. 7th Seminar Intern. Assoc. Tibetan Studies (IATS) Graz 1995 - Austria; Vol.5, Vienna, 79-96. Winkler, D. (1998b): The Forests of the Eastern Part of the Tibetan Plateau - A Case Study from Jiuzhaigou (Zitsa Degu; NNW Sichuan). In: Plant Research and Development, Vol. 47/48, Tübingen FRG, 184-210. Yang, Yupo (1985). Great importance should be attached to the ecological balance of the subalpine forest of W-Sichuan (manuscript). SichuanForest Research Institute, Chengdu, pp.15. Yang, Yupo (1986). Importance of Ecological Balance in the Subalpine Forest of Western Sichuan. INTECOL Bull. 13, 41-44. 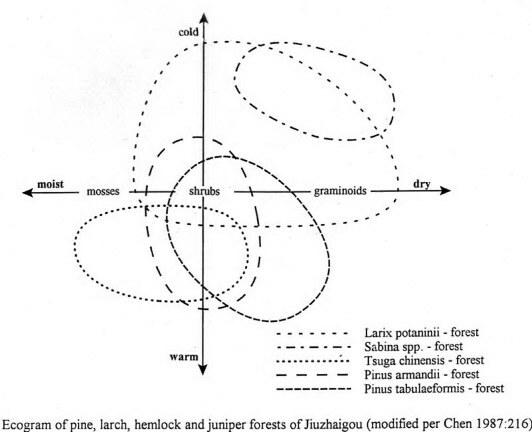 Yang, Yupo; Zhang, Jiangling (1992) Eds.. Protection and Management of Mountain Forests, Proc. 5th Intern. Workshop, Chengdu 1990, IUFRO, 269p..
Zhao, Ang (1992). (The crisis of the forest industry in the Tibetan area of Sichuan and ways towards positive development). In: Jinji Dili (Economic Geography) 12.1, Changsha, 55-61 (Chinese, translation at http://www.blasum.net/holger/wri/environ/china/for_sich.html). Zheng, Du (1986). A comparative study of geoecological and environmental problems between the Himalayas and the Hengduan Mountains. In: Li & Panday, 25-38. Photo 1: A Tibetan village in Jiuzhaigou. The architecture reflects the abundance of timber as well as precipitation. Quercus aliena is kept as coppice around the village. Pinus tabulaeformisforest with firs and spruces admixture remains in the background (2350 m, Photo D.Winkler). Photo 3: Nomad summer camp at the Konke La-Pass (Gonggang Ling, 3500 m) between Sungpan and Jiuzhaigou. Behind the camp is a partially deforested north-facing slope. The south-facing slopes (background extreme right) are free of forests (26.6.1991, Photo D.Winkler). Photo 4: Timber loading near Jiuzhaigou in Nanping County . So far Nanpings forestry resources had been used more carefully, yet, since the early 1990s, Nanping has had to meet enormous state quotas, since many other forest enterprices in Aba exhausted their resources. Photo 5: The forests of the north-facing slope (foreground) have been totally removed, leaving behind vast clear-cut areas without signs of reforestation. To the left in the background the typical forest distribution pattern is clearly developed. North-facing slopes are forest-clad, south-facing slopes are free of forests. Since it snowed the day before, they are snow covered as well. To the right a clear-cut (>) has destroyed the pattern, yet the north-facing slopes are recognizable by a whiter snow cover (SE of Aba near Longriba, 22.2.94, Photo B. Baumann).